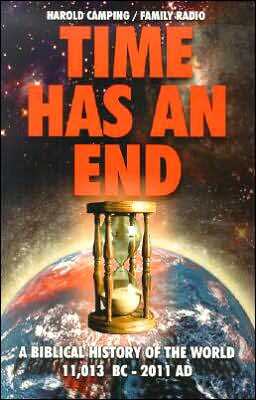 Time Has an End: A Biblical History of the World 11,013 B.C. – 2011 A.D.
11,013 B.C. – 2011 A.D. The book is written in great detail starting with earth’s creation through to the possible return of Christ and end of the world in 2011 A.D. It is the culmination of decades of intense Bible study—comparing scripture with scripture. Does the Bible really tell us how old the world is? Does the Bible tell us when the world will end? Is it really true that a “Doomsday” is coming? How do the dinosaurs fit into a world that is only about 13,000 years old? How likely is it that the world will end in the year 2011? What will happen when the world comes to an end? Family Radio is now making this book freely available like their other publications. Order over the phone from Family Radio by calling 1–800–543–1495 (USA only) or, +1 510–568–6200. Compare and search over one hundred book stores for Time Has an End. Powered by . Title: Time Has an End: A Biblical History of the World 11,013 B.C. – 2011 A.D. The Open Forum, a live call-in program for Biblical answers to questions can be heard on Family Radio stations M-F 8:30–10:00 PM ET/5:30–7:00 PM PT. Call 1–800–322–5385 (USA only) to ask your question. EBible Fellowship has no affiliation with Family Radio but we believe them to be used of God to faithfully proclaim His Word. This page is designed so it can also be printed and handed out as a leaflet. The formatting is automatically adjusted and certain text (such as this section) is hidden. For more information, see the help page for printer friendly pages.